The CD finally traveled outside the US again, and you reap the benefits! Today, we travel (back) to Lima, Peru, arguably the food capital of the Andean community of South America, for an impeccable experience dining at the Incan ruins of Huana Pucllana. “Napa and Sonoma need a break,” my father texted me after reading last week’s post. Well, I have to agree. After a year of no travel outside the USA, I have to admit this blog has bored even me. I needed to get back to this blog’s roots with real international food and travel experiences. 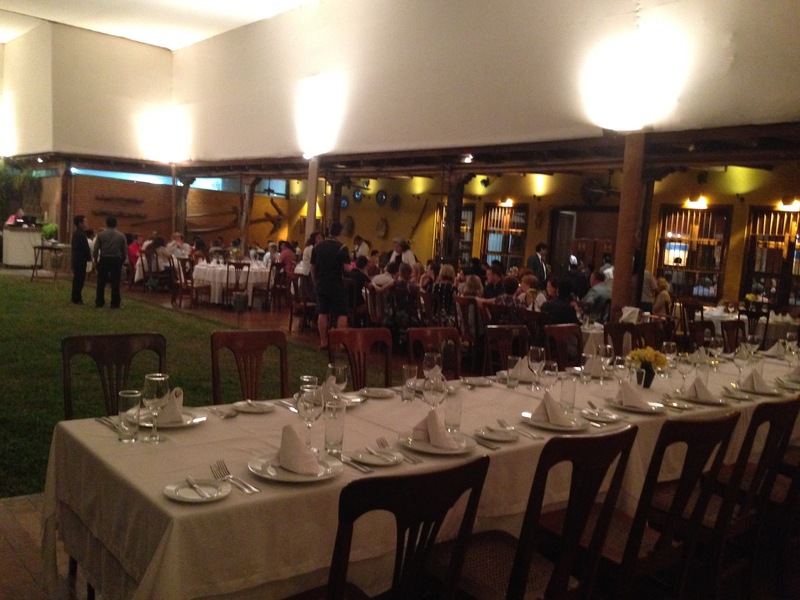 So when I traveled recently back to Peru for a wedding (more on that in a coming post! ), I took copious notes and photos. I look forward to sharing a few of these experiences with you. Many museums may take pride in their in-house restaurants or cafes, but few – if any others – can boast that the artifacts become backdrop for a spectacular meal and attentive service as can Huana Pucllana, an indoor-outdoor restaurant set amidst Incan ruins. Huana Pucllana, in the heart of Lima, Peru’s coastal Miraflores department, would be ranked as one of Lima’s top restaurants in its own right, but surrounded by intricate, ziggurat-like structures and ongoing archaeological dig sites, it gives the diner a glimpse into native Peru. Having reached the 35th anniversary of the initial excavation of the site, the project remains a work in progress, but it would be difficult to improve upon the restaurant’s Peruvian dishes.I’ve had the pleasure of dining at Huaca Pucllana twice in a two-year period, and both visits exceeded my expectations. The dining room includes a fully enclosed area and a larger, canopied outdoor dining space perfect for large parties of business colleagues l, tourists, and celebrating locals alike. At night, the ruins are well lit and provide a dramatic backdrop to food worthy of such a setting. 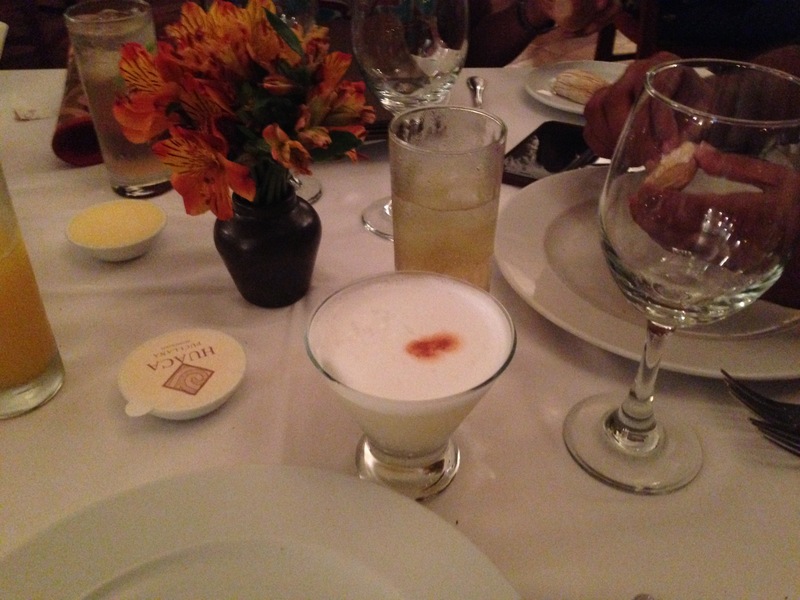 Their Pisco Sour is a perfect aperitif to start an evening. To start the meal, the restaurant has two pages of smaller starters and larger appetizers (first courses). On this second visit, we tried the fried ceviche. That dish is exactly as it sounds: tender fish “cooked” in a citrus marinade, coated with a thin layer of breading, and then deep fried, topped with fried red onion, and accompanied by sweet potato puree and canchitas (dried/fried Indian corn). It was surprisingly light, not greasy, and tender inside without a hint of acrid fishiness. It put any other fried fish to shame. 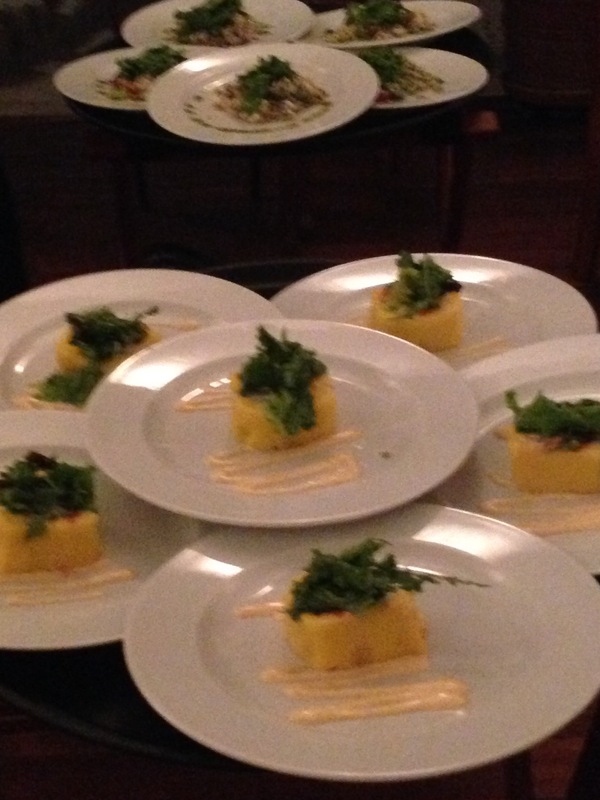 Other starters include corn croquettes, potato and seafood causas (photo below), traditional ceviche, and more. If you’re feeling more adventurous, try the chicharron de cuy (Guinea pig – yep, that Guinea pig), an Andean specialty. Its wine list featured an impressive selection of South American wines – even those from Peru (not known for its wines, as most grapes are grown for Pisco – you can read more about Pisco in a previous CD post here), but more extensively, from Chile and Argentina. 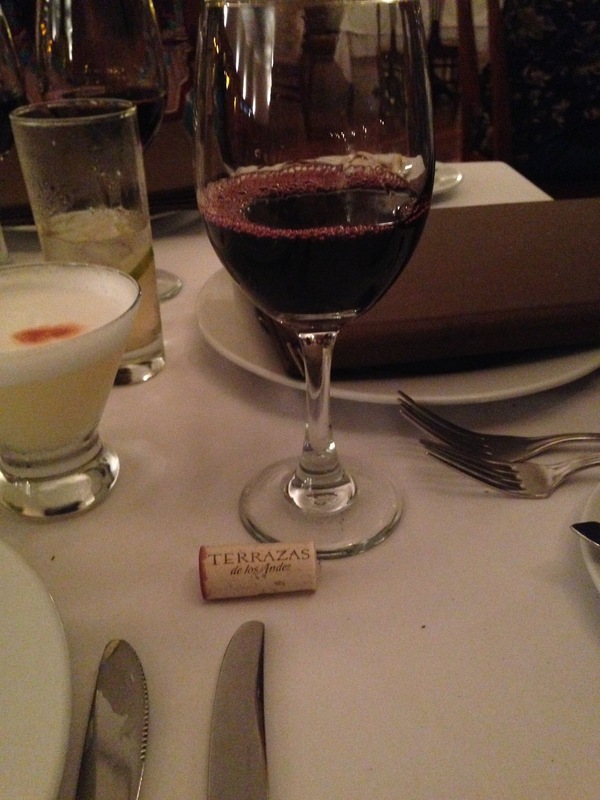 We selected a 2013 Malbèc from producer Terrazas de los Andes for our meal. For my main course, I couldn’t turn down the alpaca steak, a rare delicacy I cannot find outside of the Andean community. For those who have never heard of or tried alpaca meat, think of it as the llama’s smaller cousin. While llama meat more resembles pork in color and texture, alpaca is a more tender red meat, more like rare beef or non-gamey venison. Most of you probably have not had access to either meat, but if you have the opportunity, try a medium rare to rare alpaca steak. It is tender and inoffensively meaty. 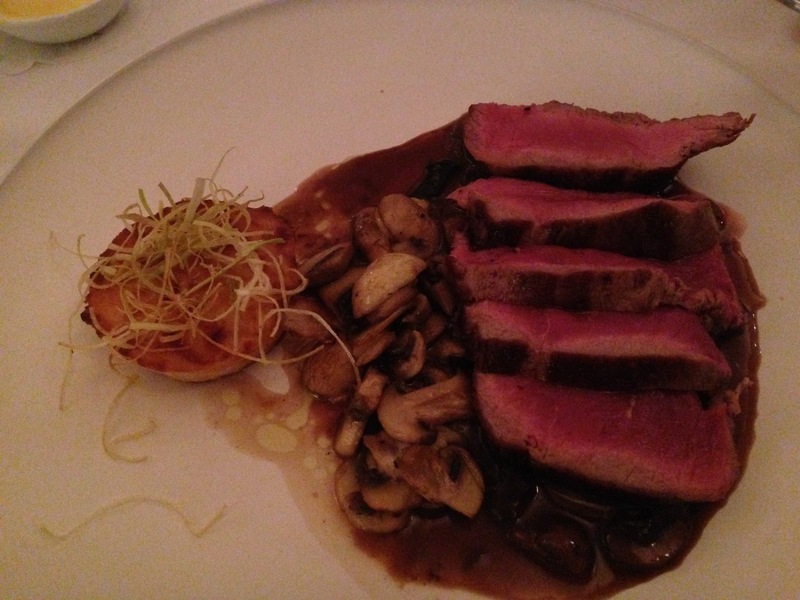 The steak was served simply with a mushroom au jus reduction and a small, airy corn soufflé. I’m fairly certain that I also ordered the alpaca on my first visit, but I vaguely recall that it may have been served with a barley risotto instead of the corn soufflé. 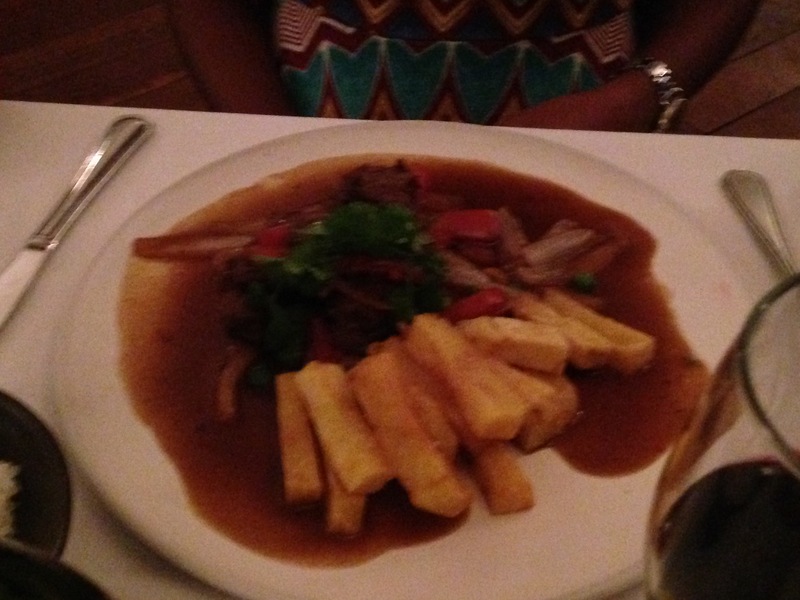 One of my friends chose Peru’s (and Huana Pucllana’s) signature dish: Lomo saltado. This dish consists of strips of beef steak, sautéed with tomatoes, red bell pepper, and onion in oil and soy sauce. As is typical, is served with both French fries and white rice. Why two starches? The carb overload boggles my mind. Huana Pucllana’s is one of Peru’s best renditions, its steak far more tender and flavorful than in most restaurants. 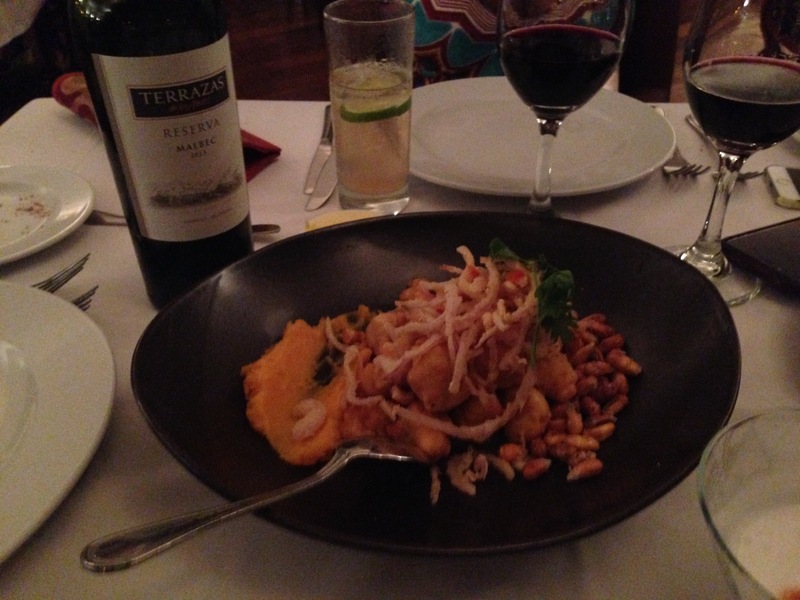 Another friend ordered aji gallena, another Peruvian specialty. 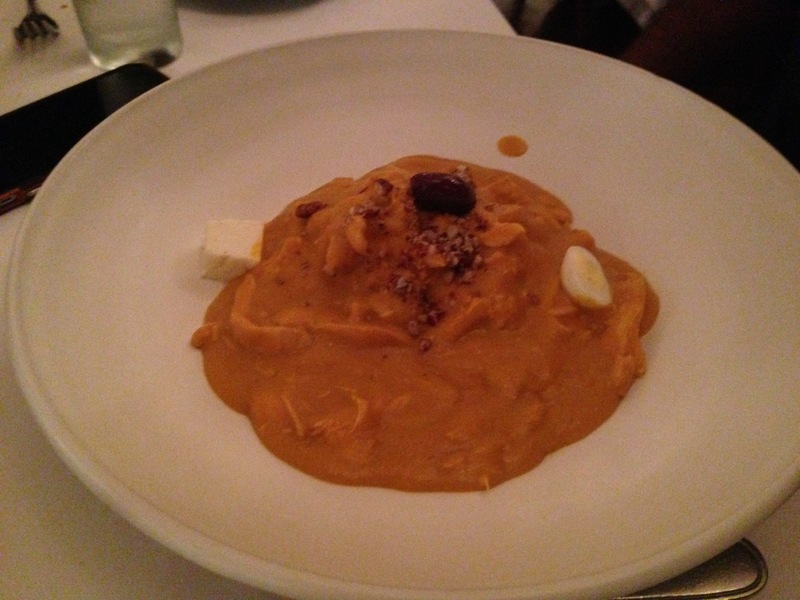 Essentially it is a mildly spicy chicken stew, resembling yellow curry in appearance but not flavor. Its thick aji Amarillo (yellow) sauce is more sweet and creamy than one might expect. In some restaurants, that flavor is almost single-noted, but it is far more complex at Huana Pucllana. 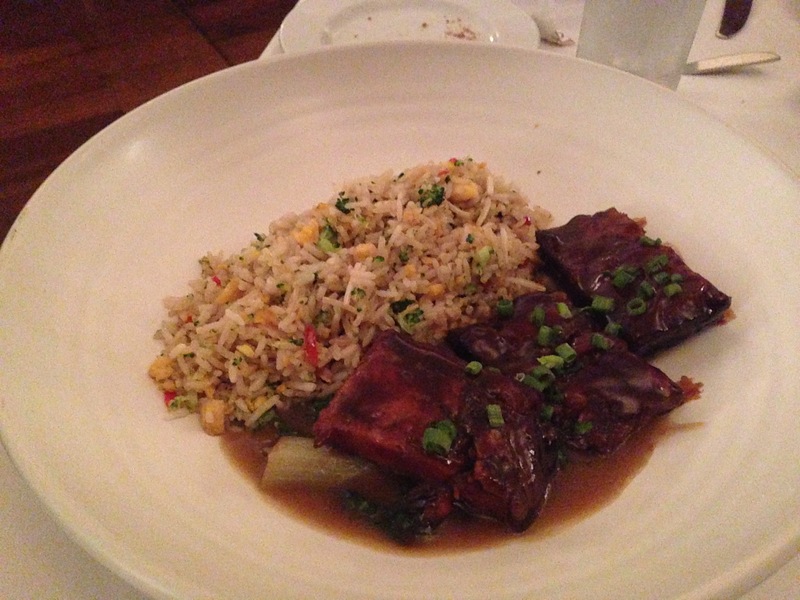 My friends’ relatively adventurous son ordered an adult main course of pork belly over stir-fried rice, a nod to Peru’s Chinese chifa” (also known as “chaufa”) culinary fusion. The menu offers so many more tempting main dishes, including fish, beef, duck, pastas, and vegetarian options. It would take many visits for me to try everything I wanted to try. 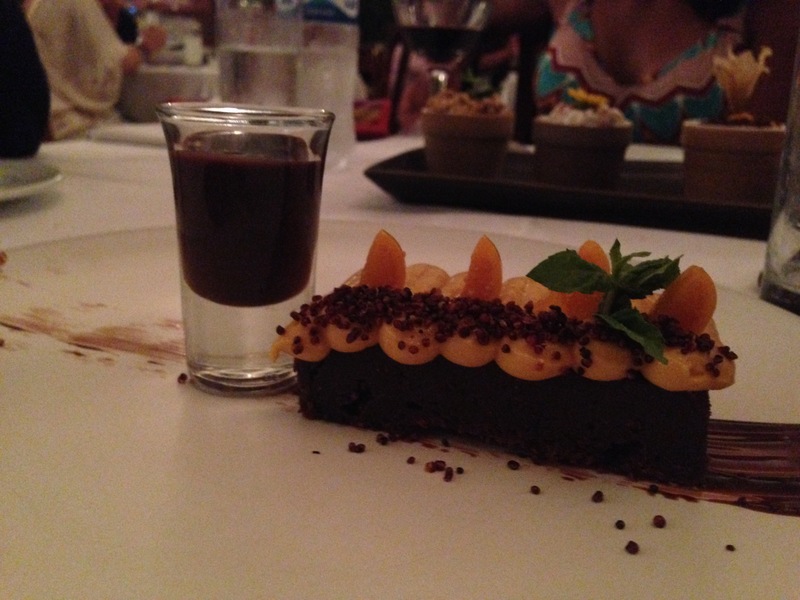 With a tantalizing menu of postres (desserts), I couldn’t turn down what I did two years before. We ordered two desserts for the table. The first was a dark chocolate “truffle bar” (more like a slightly less sweet brownie) topped with lucuma mousse and served with a side of homemade chocolate sauce (similar to but less thick than that served with churros). Sidebar: Lucuma, in my opinion, is a fascinating fruit. It has the smoothness and texture of pumpkin but almost as if that pumpkin had a hint of vanilla or floral character. I absolutely love it paired as a delicate, cool counterpoint to chocolate. 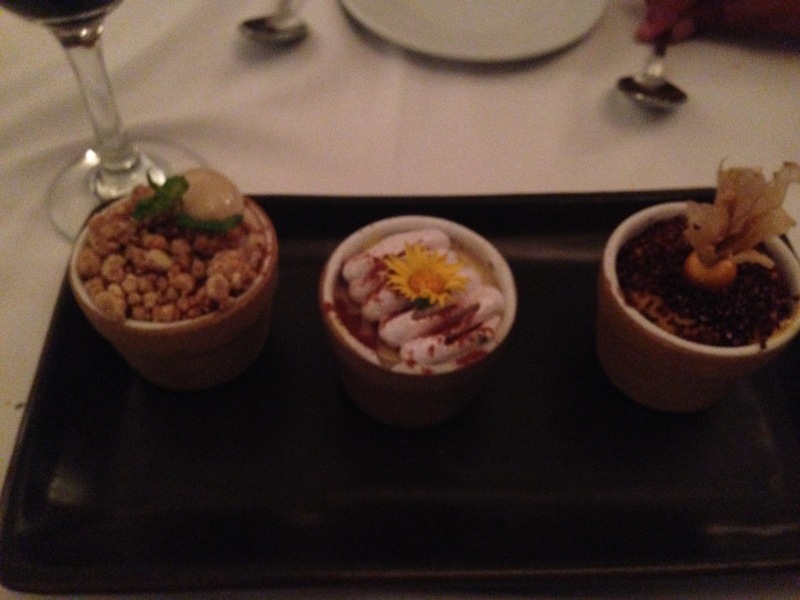 In fact, our second dessert was a trio of dessert pots (literally served in miniature flower pots) and included a lucuma-chocolate parfait. A subtly lemon-flavored suspiro (custard made with condensed milk) was served atop the slightest bit blink-and-miss, fluffy cake and topped with merengue comprised the second pot. The third was rice pudding flavored heavily with cinnamon and vanilla. He three pots would have been enough for the four of us, but we would have lost out on unique flavor combinations had we not ordered both desserts. I had a short window during which to dine in Lima on this visit, but I was more than happy to have made a return visit to the lovely and historic Huana Pucllana.